If it gains FDA approval, dimethyl fumarate, or BG-12 could be another option to treat one form of MS.
A chemical that can be used as a food additive, caused serious skin infections after people sat on sofas treated with it and was approved as a psoriasis treatment in Germany 15 years ago, may prove to be a viable treatment option for people with the relapsing-remitting form of multiple sclerosis (MS). Dimethyl fumarate - also known so far as BG-12 - could be another weapon in a neurologist's arsenal to treat the disease, if the drug is approved. Based on the results of two large studies published in the New England Journal of Medicine, experts believe this is likely. More than 2 million people around the world live with MS, a disease where the body's immune system attacks the patient's central nervous system and destroys the myelin, or sheath, protecting nerve cells. Most people are diagnosed between the ages of 20 and 50, and more women than men are affected, according to the National MS Society. As the disease progresses, it can become quite debilitating, leading to numbness and difficulty walking and seeing among many other symptoms. "Relapsing MS is a disease that we have treatments for, but they're really on two ends of the spectrum," says Dr. Robert Fox, a neurologist at the Mellen Center for MS at the Cleveland Clinic. "We have injection treatments that have modest efficacy. They reduce relapses by about 30%. "And we have very effective therapies, but they are infusion therapies and they have risk - risks of a brain infection - that may be fatal," Fox says. "This new treatment offers the opportunity for sort of the best of both worlds, in that it has very good efficacy, but it's in the form of a pill and appears to have much reduced risk than other therapies." Fox, who is the lead author of one of the studies, says both studies published Wednesday were designed in the same way so their results could be examined together. Both were large trials involving more than 1,400 patients in many countries and both compared BG-12 to a placebo - a common scenario when seeking drug approval. He says both studies showed BG-12 reduced the number of relapses, reduced the number of lesions or scars on the brain and progression of disability and was more effective than standard injectable MS drugs. Both studies found BG-12 was well tolerated and seems to be safe. They looked at taking the pill two and three times day. Fox says between the two studies, taking the pill three times a day wasn't significantly better than twice a day, which is why the FDA drug approval application only refers to twice daily dosing. Timothy Coetzee, chief medical research officer for the National MS Society, says the study results look very promising. He says it's a "good news story for people who live with MS" because the pill has been shown to be effective in reducing the number of relapses. Coetzee says it's too early to say BG-12 is superior to other MS drugs in pill forms, as studies haven't been done yet. Based on these results of these two studies, Fox and Coetzee believe the FDA will approve the drug. Only after that happens will we know what name manufacturer Biogen Idec will sell BG-12 or dimethyl fumarate under, as well as its price. The FDA has until December 28 to make a decision. If this happens, BG-12 would be the third MS drug in pill form approved by the FDA. Just last week, the agency approved another MS drug in pill called Aubagio. It too was shown to be effective in reducing the number of relapses, slowing down disease progression and reducing the number of brain lesions. The first pill, Gilenya, was approved two years ago. Like any drug, these new MS drugs in pill form have their pros and cons. Each of these pills "targets a different part of the immune system in a very specific manner," says Coetzee, which may influence what a patient may be prescribed and how they react to each drug. Side effects also are a consideration. Since people as young as 20 could be diagnosed with this disease that affects 2.1 million people worldwide, women who want to get pregnant or who are pregnant would not be a candidate for Aubagio because it could cause severe birth defects. Patients taking Gilenya have to be monitored for the possibility of their heart rate slowing down. Earlier this year, health agencies in the United States and Europe were reviewing safety concerns after 11 deaths were linked to patients taking Gilenya. BG-12 is not without side effects. The two-year clinical trials showed common side effects including skin flushing and some nausea, vomiting and diarrhea - usually in the first month. After that, Fox says, patients did quite well. What hasn't been seen in patients so far is an increased risk of infections or cancer with this drug, says Fox. And then there are still the older injectable and infusion drugs that may still work very well for those patients taking them. Coetzee believes some patients may want to wait until these drugs stop being effective and then shift to another option. Cost could be another issue. Aubagio costs about $45,000 per year; Gilenya about $48,000. Twenty-five years ago, options were few for MS patients. Now doctors and patients have nine options and perhaps 10 by the end of the year. "That's really good news, if you're diagnosed with the relapsing forms of MS," says Coetzee. But he notes that those with more progressive forms of the disease are still awaiting treatment choices. The company doesn't claim that the drug cures MS. It relieves the symptoms greatly. And it is an oral medication, versus an injectable, with a much better side effects profile than the other oral meds. In short, it relieves human suffering and improves quality of life for MS patents. The company is working on a drug that cures MS as are many other companies. Not an easy thing to do. your right – same reason there will never be a cure for cancer. Big Phara makes alot of $$ off the chemo drugs and they work hand-in-hand with the FDA to squash finding cures. It's hard to CURE a disease when you don't know what CAUSES the disease or why it does what it does. All they can do is try to curb the symptoms and slow it down/knock it off line for a time. There are people (doctors, not pharma companies) that are doing constant research to try to identify WHAT it is and WHY it does what it does. When they figure that out, they may be able to find some sort of therapy that stops it from happening. It isn't like a virus or infection that you can kill, it is a malfunction. You are so right Lynnie ... WAKE UP PEOPLE. If people really think Big Pharma are truly finding a cure they sure are very naive. Why would they want to cure a chronic condition? They would no longer be needed and the billions they forecast for years ahead is proof they want us to stay sick so they can dish out their ineffective drugs causing serious side effects. Those who are bullied, fear mongered and intimidated by their MS neuro better get their heads out of the sand before it's too late. This drug has been out for 15 years, is used as a food additive, and was approved as a psoriasis treatment in Germany 15 years ago. So, now that they've found it is good for MS, watch them jack the price up to compare to the other MS drugs at about $40k a year. You know no one is paying that much for a food additive or a psoriasis drug, but they will still increase the price dramatically now that they have found another use for it. It's not like it cost that much, or they have to recoup research costs, that was done years ago. My wife has RR MS and is on Copaxone. It cost $3900 per month. The shots are often painful. You should contact Shared Solutions. I only pay $35/month. That's outrageous. Just want to give a little bit of an update on what's being done for MS by pharmaceutical companies. All major pharmaceutical companies are heavily invested in coming up with either a cure or a drug that would totally alleviate the symptoms. Many of them are very close to that goal and I expect to hear something positive within the next 5 years. Many drugs are already in clinical trials and the data is promising...so just hold on. i have been living with RR MS for 11 years. done all the ABC drugs, infusions and started taking the 1st pill for gilenya a year ago. they are all either painful with bad side effects, or scary with numerous uncomfortable side effects. the cost is outrageous for all of them. please keep doing studies, please. one day i want to see a headline that says "cure for MS finally found". DUDE you probably have a good insurance and your co-payment is $35 for a month supply. For those that don't have insurance the injectables are anywhere from 2000-35000 a month. When you have a pre-existing condition you can not get insurance. In some States you can get into an insurance pool but the monthly premium is about $1,000 a month not to mention that you can not use the insurance for a year to treat your pre-existing condition. Just for this reason alone I am voting Democrat. It is not a political issue , this is a life or death issue. Johnny, Shared solutions will work with your co-pay. my co-pay was $700 a month and they took my income status, and I am not in a low status but not wealthy either and they gave me a $10 co-pay through another shot company I had. shared solutions does the same thing. Johnny, I too am on Copaxone and my insurance covers it, thank God. However I have been very involved with Shared Solutions (or I should say they have been very involved with me) from day 1. They do actually have a plan for people on Copaxone who either have co-pays, deductibles or no insurance. They are always pushing their "financial aid" programs if a patient needs help with meds. Please get involved with them, it's worth a call if nothing else, that's a lot of money to have to pay every month. I heard about this drug months ago. My Dr was thrilled for me being I have both Psoriosis and MS. I am now on tons of pills plus injections. He feels this pill will be amazing for me. I am a bit nervous as it took many months to get the injections up to the correct dose before it took effect and for me to go off them and start something new, is a bit scary, hearing about what the price can be, oh boy thats scary also. Right now I do have coverage but by next year I wont. all of this stuff about drug prices is criminal!!!!! Fumaric Acid Ester is the supplement in BG-12. Biogen bought out the rights to the Germany med for psoriosis in 2007 and made BG-12 a time released med because this med leaves the blood stream so fast. The side effects for the Germany version were so bad that more the one 1/3 taking it stopped, on the average. This med has been used as an anit-mold treatment for leather too that was banned in most European countries because of the adverse alergic reations to treated leather furnature and shoes. Fumaric Acid Ester supplements ares available for $25 per 100 tabs right now. You just would have to take them very often to be effective as a MS DMT. It works for treating psorisis at quite low doses without having to take it as often that is required for a MS DMT. 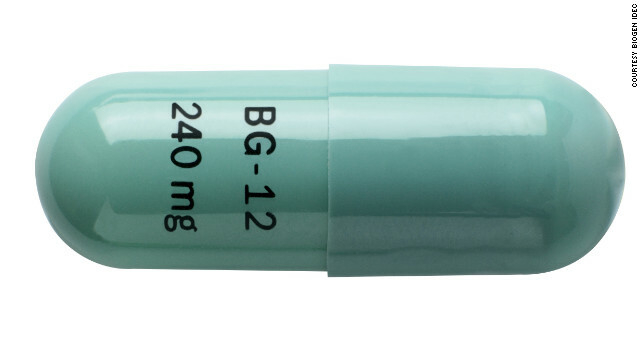 The long term effects of BG-12 is not known. All MS DMTs are a crap shoot. FYI, I've been taking Gilenya for over a year without any side effects. It is very disappointing that CNN will only report on very toxic Pharmaceutical treatments for MS, yet we hear nothing from them in regards to the biggest breakthrough NON Pharma treatment regarding CCSVI. Why will CNN not investigate and report on the vascular abnormality (CCSVI) and MS and all the MSers that have now been treated with a very safe venoplasty procedure and how their their quality of life has improved beyond any drug treatment. what is CCSV I have had MS for almost 22 yrs (was diagnosed when I was 20 & went blind in my left eye) I have been on meds – Copaxone & Rebif & decided 7 yrs ago I didn't like the side effects and have been doing nutritional stuff to make it better but it is not working now – Looking for something to make it so that life can resume normally.....???? I've had MS since 1988 and taking low dose Naltrexone (LDN) since 2005. I am super excited for the approval on BG12 so I can get of Tysabri. I have had MS since 2007 and after trying 2 diff shots,the tysabri has been the only thing to work so far. I would love to just take pills daily rather then a painful infusion. Theonly problem I may have is I am also a diabetic (human pin cushion). Does anybody either have diabetes or know anybody who has both? If so what are the effects of the BG12 on the diabetes? My Wife Amy has had MS for 5 years, in a wheelchair 1.5 years. Amy's mobility was at the point assistance was needed to transfer from chair to stairlift Etc. and took Rebif,Gilenya and Rituxin with little relief. Last year she tried a stem cell treatment and for about a year needed no help transferring had improved mental / bathroom issues. Stem Cell treatment is the best hope for the future, it gave her the best results and relief.